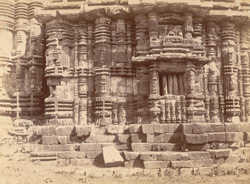 Photograph of the south façade of the bhadraka (mandapa) of the Yameshvara Temple, from the Archaeological Survey of India Collections, taken by William Henry Cornish in 1892. The Yameshvara Temple was built in the late 13th Century and consists of a sanctuary and a mandapa richly carved. Inside the courtyard in which the temple stands there are remains of other temple towers that date back to the 7th Century.